Properly marked fire lanes are not only required for compliance reasons but are needed for safety as well. Fire lanes play a pivotal role in fire safety during an emergency situation. In case of an emergency, clearly marked fire lanes allow fire trucks and other emergency vehicles access to the scene as quickly as possible. 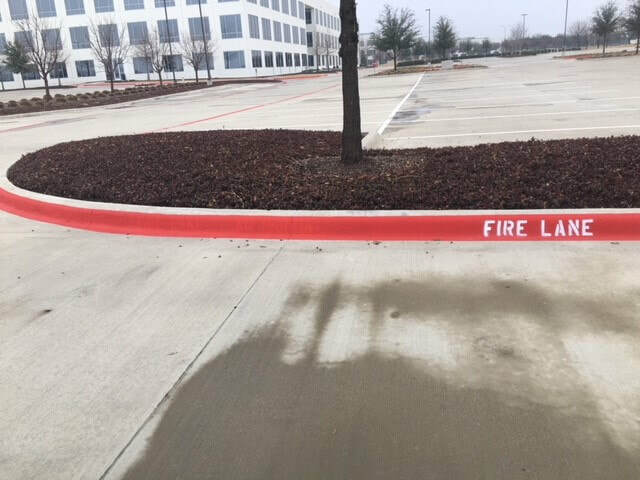 Our professional striping crew will make sure your fire lanes are clearly and properly painted and stenciled, as well as making sure the entire parking area is fully compliant with city and state codes and able to pass inspection. Fire lanes must be clearly marked where required around the perimeter of your business, and need to have clearly visible signage, to prevent unauthorized vehicles from parking in a fire lane. This is for the safety of everyone on the property including employees as well as patrons to your business. The fire lanes on your property need to be clearly and properly marked with paint or signage. Fire lanes should be the color red with the words, "FIRE LANE NO PARKING" clearly stenciled in white on top of the red paint. Additional metal signage can be added where needed or required to indicate the fire lane area. Keeping your parking lot compliant with all fire codes is very important. Our striping team will make sure your fire lanes are all stenciled properly to meet the compliance requirements. A pre-inspection by the fire marshal is always recommended and will provide information about the fire code requirements. 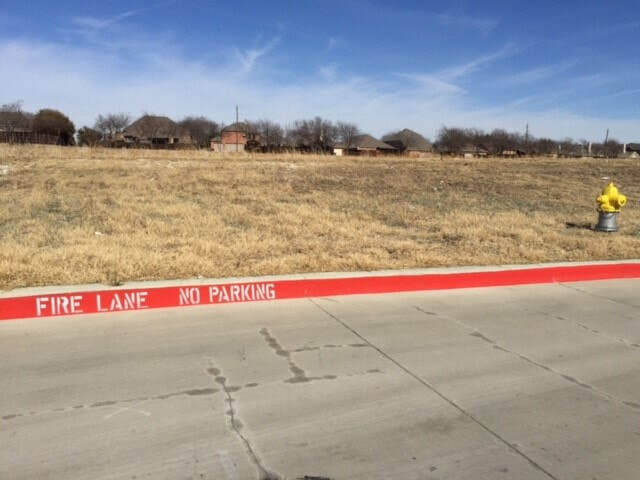 Typically, all curbs and adjoining fire lanes must clearly be painted red with white lettering that reads “FIRE LANE – NO PARKING”, which should be painted every 20 feet. Our professional crews will use approved stencils to label fire lanes properly. Stencils not only look professional but enable us to paint the letters accurately and to also comply with the required standards. Once you have contacted us to paint your fire lanes, we will make sure we use the proper fire lane dimensions, colors, and lettering that are required by the state and local codes. ​We are ready to provide you with a free quote for all of your striping needs in your parking lot. Call today and we can schedule a time to get this quote to you.